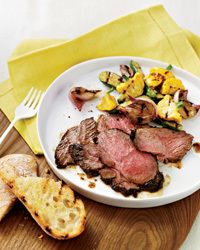 Start two days—or just two hours—ahead with our spectacular grilling planner. 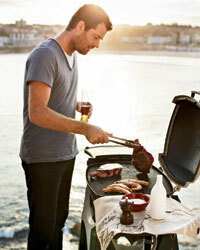 Tip: The more salt or acidity in your marinade, the faster it will work. Tip: A simple paste made with oil and spices can be rubbed on tofu two days in advance. Recipe to Try: Spiced-Tofu Sandwiches Balsamic-Marinated Flank Steak Recipe Photo © Lucas Allen. Tip: A balsamic vinaigrette doubles as a marinade. During a 24-hour soak, steak picks up enormous flavor. Tip: Add spices and herbs to brines for extra flavor. 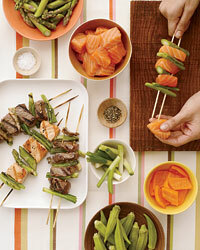 Tip: The calcium in yogurt tenderizes food fast, so meat and fish don’t need to marinate for long. 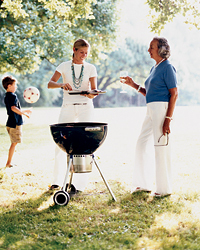 Summer Grilling Guide: Apple-Glazed Barbecued Baby Back Ribs Photo © Quentin Bacon.